Warnings and watches for Brazos, Burleson, Washington counties were cancelled as of 3amCDT. COLLEGE STATION, Texas — The National Weather Service is forecasting the possibility for severe thunderstorms late Wednesday night into early Thursday morning. 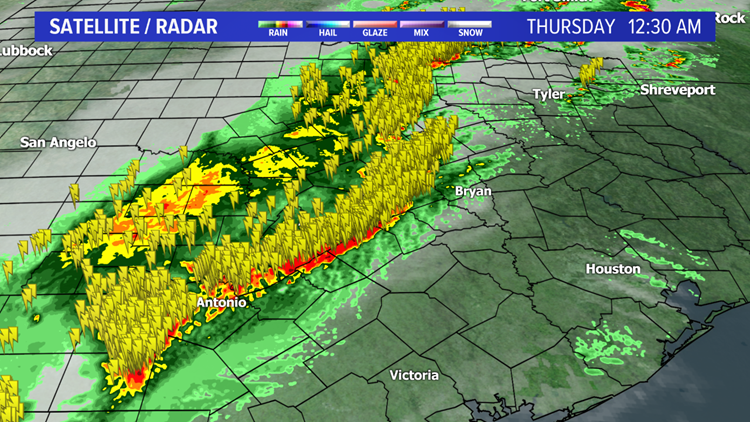 The storms are predicted to impact College Station and all counties to the northwest and southeast. A severe thunderstorm warning was issued for Brazos, Burleson, Washington, Grimes, and Waller Counties as of roughly 2:18amCDT Thursday. Those warnings expired at 3amCDT Thursday morning. Severe thunderstorm watched, a step down from a warning, and areal flood advisories were issued for portions of Brazos County and set to expire at 3:45amCDT. Some flooding was reported in prone sections of Brazos County. As of 3amCDT, Huntsville, Texas was under a severe Thunderstorm warning. KAGS Meteorologists Bob French and Gene Perez predict that the worst of the storm will begin at roughly 1am and last until approximately 4am Thursday morning. Heavy rain, winds, and hail are all a possibility. Storm watchers, so far, have not indicated any hail or tornadoes spotted in this system. National Weather Service mentioned the possibility for about 1'' to 3'' of heavy rainfall with localized flooding possible. There is a potential for straight-lined winds at roughly 50 to 60 mph. The storm was forecasted to impact Robertson County, as parts of the county are still reeling from a tornado that destroyed 55 buildings on Saturday. As of 1:25am, the straight lined winds in the storm had largely passed through Franklin and Robertson County. Download the KAGS App wherever you get your apps and follow the KAGS TV Facebook and Twitter pages for immediate updates on the storm.